Celebrate American history by suiting up in your very own presidential outfit. If you need costume ideas for a good Early American colonial costume, you are visiting the appropriate website where you can shop for the best sale prices on discount George Washington costumes for kids and men. These colonial costumes will help you disguise and transform yourself into one of our famous “Founding Father” of the United States, President George Washington, who built a solid foundation for our country. The new Halloween costume listings below will give you a good selection of George Washington costume ideas. Now that your children are back to school, you will probably need a kid President George Washington costume for a school play, book report presentation, patriotic event, historical reenactment, school wax museum, community theater, costume party, and even Halloween. We currently feature all the best sale bargains on US colonial style clothing and costumes for adult men and children. We also have recommendations for women costumes and clothes for this time period. 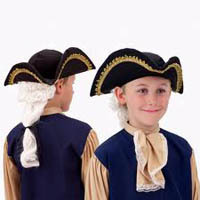 This handsome colonial ensemble for children will impress any audience for a school play or historical presentation. 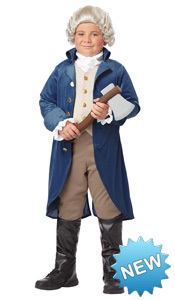 This child President Washington costume for boys includes a handsome blue colonial jacket with vest & white ruffles and tan pants. Available in boy sizes medium to x-large. 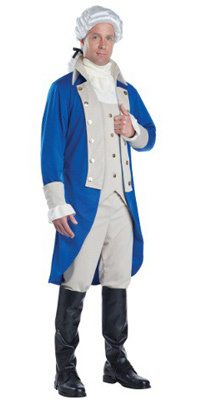 Suit up as a handsome revolutionary war hero in this classic blue General Washington costume. This is fantastic for historical plays or reenactments. Available in men’s sizes small to x-large. If you want to wear a deluxe high quality George Washington costume for historical re-enactment, school, or theater, this impressive American revolution uniform will fulfill your needs. This colonial era costume design features a brass buttoned navy gabardine jacket, tan collar, tan vest, cuffs/pocket flaps, lapels, and matching knickers. Men sizes standard or extra-large. 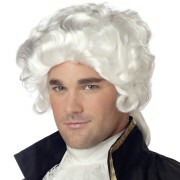 This costume is designed for plus size men so you can suits up like the famous American Revolutionary War hero. Available in plus men sizes 2X and 3X. 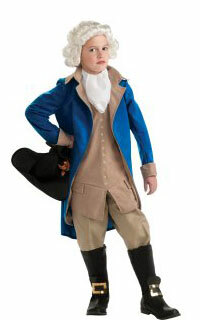 Lead the American revolution in this deluxe General Washington costume for kids! This is available in boys sizes small, medium, large, and x-large. This historic child costume includes a colonial hat, stylish blue general uniform coat, tan vest with attached white shirt and tan pants. Boot covers sold separately. Available in boy sizes small, medium, or large. 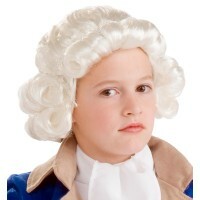 This classic colonial white wig for children features short barrel white curls that will give your child’s colonial costume an authentic President Washington look. 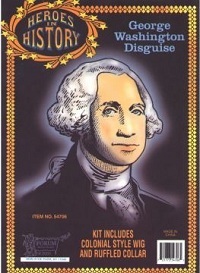 This “Heroes in History” disguise kit for kids includes costume accessories such a child size white colonial hair style wig and white collar jabot to complete your child’s President Washington costume. If you need a wig for your child’s costume, this would be a good choice. 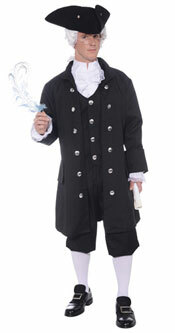 This classically handsome Founding Father costume includes a colonial jacket, cropped pants, and front vest. 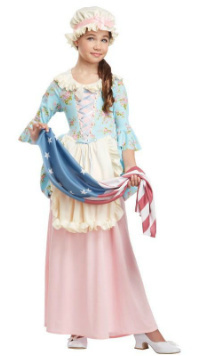 This is a beautiful colonial dress for girls who need a patriotic Martha Washington costume. 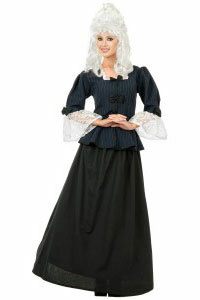 This elegant colonial woman dress will make the perfect Martha Washington costume. Available in sizes small to x-large. 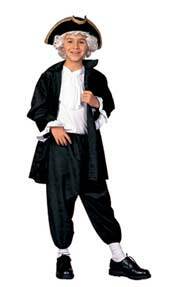 Your child will look great dressed up as President Washington in this child costume set that includes a black velvet jacket, shirt front with jabot and matching pants. Boy sizes small, medium, or large. 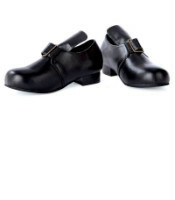 A perfect pair of black colonial style shoes for your child’s outfit. Available in multiple boy’s shoe sizes. If you need an affordable economy white colonial style wig with ponytail, you can buy this one to accessorize your George Washington Costume. This wig fits adult men or older kids. This boy’s size American colonial hat with white hair will be a good choice in enhancing your child’s Washington costume. 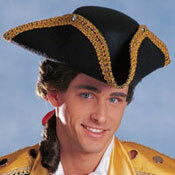 Complete your colonial era costume with this classic style black tricorn hat with ruffled gold trim. One size fits most adult men and teens. These pair of colonial shoe buckles will slip on most black shoes so you can create your own affordable pair of colonial shoes for you or your child’s President Washington costume. 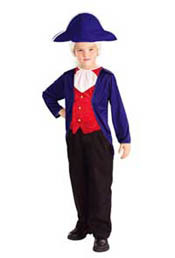 If you are on a budget, you can buy this low cost George Washington costume for children which includes a blue hat and matching long sleeve blue jacket with attached white jabot and red vest. Please note that black pants and wig are not included. 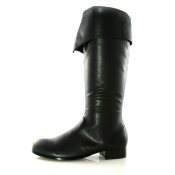 This pair of adult mens boots in black will make a great costume accessory for most George Washington costumes. Men sizes Small (8-9), Medium (10-11), or Large (12-13). 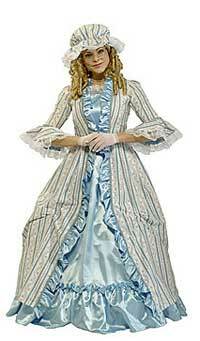 If you are searching for more colonial costumes such as Mrs. Martha Washington costume dresses, you can visit this page. 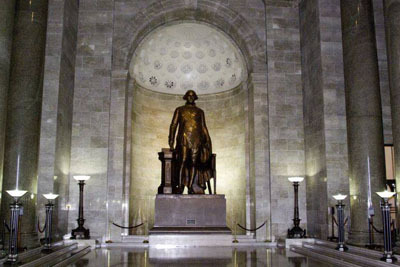 Short documentary on President Washington.